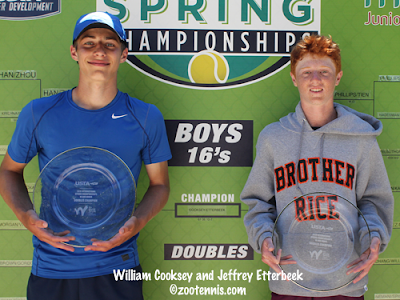 Two wild cards and two top seeds will meet Sunday for ITF Grade B1 International Spring Championships singles titles at the Dignity Health Sports Parks after all advanced with straight-sets win Saturday. Defending champion and girls No. 1 seed Hurricane Tyra Black was the closest to going to a third set, when unseeded Katrina Scott twice served for the second set, at 5-4 and at 6-5, holding a 40-0 lead in that 12th game. "I honestly thought the set was going to be done," said Black, who went on to win 6-3, 7-6(3). "But she made three mistakes in a row and I was like, I can do this. Then the whole tiebreaker I was really nervous--I don't seem like it some time, but I am--I was super nervous, and then I started cramping the last two points." Up a mini-break at 4-3 in the tiebreaker, Black held her two serves, with Scott sending two consecutive forehands long to make it 6-3. Black converted her first match point when Scott's backhand found the net, while Black was unable to shake hands with Scott or the chair umpire due to a hand cramp. "I couldn't change my racquet grip to anything but my slice," Black said. "I couldn't move my hand, it was stuck in that one place and it got a little annoying." Black's opponent in the final will be 15-year-old wild card Connie Ma, who defeated No. 13 seed Robin Montgomery 6-3, 6-4 to reach her first Grade 1 final while playing in just her third ITF Junior Circuit tournament. Ma got the only break of the first set in the third game and held throughout, having no difficulty standing up to Montgomery's pace. Montgomery took a 2-0 lead in the second set, but lost the next four games, with Ma just too steady. "I knew I had to break back, but because that would be a huge momentum shift for her," said Ma, who plays few competitive events during the school year. "I tried my best to get the next game and thankfully, I did, otherwise it would have been hard to get back into it. It can shift your play a lot. Sometimes when things aren't going your way, if you can get a couple of games, your whole mood and attitude changes, and that helps you play better." Ma, who expected Montgomery to play her aggressive baseline game, knew she had to keep control of the points. "I just tried to keep her moving and make sure I don't hit every ball right to her, because if she just stands there, she's going to dictate and that would be troublesome for me," Ma said. Black, who at 18 is facing younger players regularly in this Southern California junior swing, said she has little experience with Ma's game style. "I think I played her in doubles here last year, but you don't really learn much about somebody in doubles, so we'll just have to see tomorrow," Black said. Black, currently at 13 in the ITF junior rankings, said she will be relaxed in the final, since reaching the championship means she will retain a Top 20 ranking regardless of the outcome of the match. "Now that I'm in the finals, I don't have to worry about the points or anything anymore," Black said. "So tomorrow, win or lose, it's really exciting for me." Top seed Liam Draxl of Canada advanced to his first Grade 1 final, defeating No. 12 seed Andrew Dale 7-5, 6-3, his fifth consecutive straight-sets win. Serving at 5-all in the first set, Draxl saved four break points, and immediately went up 15-40 on Dale's serve. 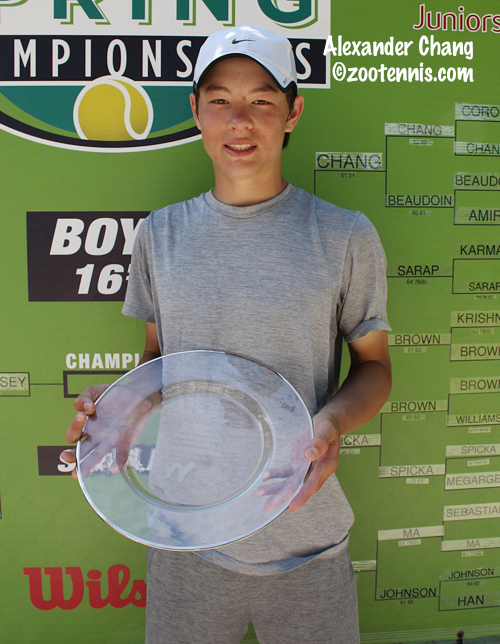 "I was was down three, four break points, but ended up coming out of that game, which was like 15 or 20 minutes," said the 17-year-old University of Kentucky recruit. "That was the biggest game of match." Draxl is vocal and emotional on court, but he said none of the exhortations, he gives himself, like his frequent "Wake up", are strategic. "I'm crazy on court," said Draxl, who is from Ontario. "I just say that all the time when I'm down in the first set, it just sparks me a little bit. I don't even know what I'm saying." Draxl's opponent in the final is wild card Zachary Svajda, who cruised past unseeded Stefan Dostanic 6-1, 6-1 in the second boys semifinal of the day. The 16-year-old from San Diego has lost only three games in his past three matches, receiving a walkover in his quarterfinal match Friday. 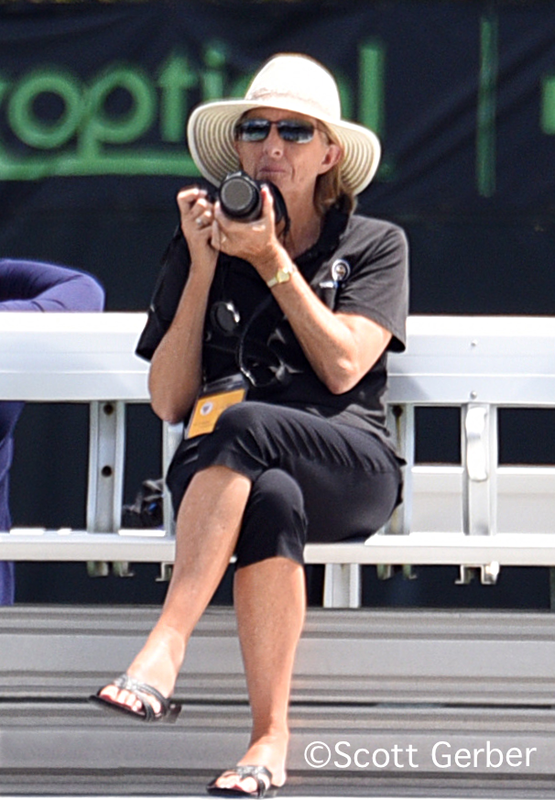 "I've been playing better throughout the tournament," Svajda said. "The beginning was a little shaky (a 4-6, 7-6(4) 6-2 win over No. 4 seed Martin Damm). Especially in the round of 16, when I won 1 and 0, I was playing really well. As long as I keep it up for tomorrow." Svajda was happy with his level throughout the match against Dostanic, who he played many times when both were 12 and under, but not since then. "We played a lot when we were younger and it was always back and forth," Svajda said. "He would win one, I would win one, but we haven't played in what, five years, until we met here." After holding to start the match, Dostanic lost ten straight games, and while Svajda said he was returning well and handling Dostanic's big shots, most of the points ended with Dostanic making an error. It wasn't until Dostanic broke Svajda serving at 4-0 that a comeback seemed possible, but Dostanic double faulted three times in the next game and Svajda held for the win. "At 4-1 in the second, I thought maybe he could pick it up, and I was getting a little tight," Svajda said. "He was playing a little bit better, it was definitely closer in the second. It was a little windy, and he hits really big, but I was pretty consistent and moving well, so he didn't hit too many winners." The boys final is schedule for 10:00 a.m. PDT Sunday, followed by the girls final. The 16s champions were crowned Saturday morning, with unseeded Alexander Chang and Winta Woldeab taking the titles. 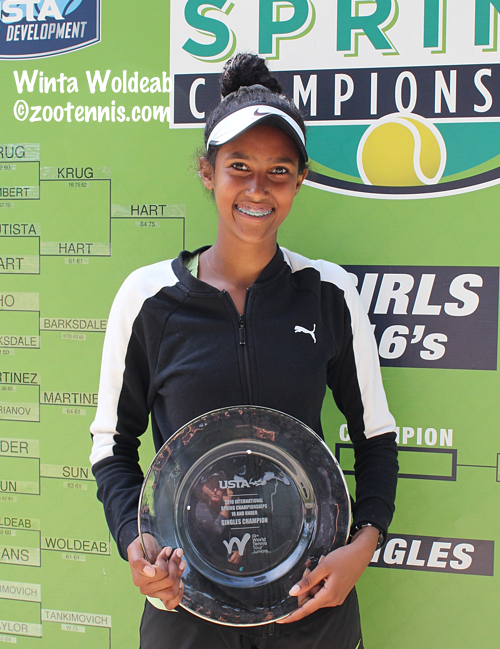 Woldeab unseated defending champion Anne Lutkemeyer 6-3, 6-4, closing out her sixth consecutive straight-sets victory to join her brother Siem as a 16s International Spring champion. Woldeab, 15, broke Lutkemeyer to end the first set, and did the same in the second set, eventually forcing the action on match point by approaching the net. "She's a fierce competitor, she wins a lot, so I had to play with my strategy, keep it going, and that's what won the match," said the unseeded Woldeab, who trains at both the Barnes Center in San Diego and with Bob Simmons at the Peninsula Tennis Club. "She had really good, powerful ground strokes, moved well from side to side. I just kept in mind that I had to play my game, and I did." No. 7 seed Lutkemeyer, who won the title last year at age 13, decided to defend her title in order to assure herself of matches. "We weren't sure if I would play 16s or 18s, just because if I played 18s, I would have probably gone into the qualifying," Lutkemeyer said. "So we just decided to play 16s, to get some matches in. Next year I'll definitely be playing 18s." Woldeab had breezed through her semifinal match, while Lutkemeyer needed nearly three hours to get by Ria Bhakta, and she admitted she felt the effects from that contest. "I'm a little tired from yesterday, but I really wanted to play well today, so I didn't let that affect me at all," said Lutkemeyer, who trains with Kevin Jackson and the Jackson-Bridge Academy in Fountain Valley California. "I think she played a really solid match. She was getting a lot of balls back, making a lot of balls in; she hit a lot of heavy spin balls. So she was backing me up and she took the right opportunities, played a really good match, really consistent and at the right moments she was able to get those points." Lutkemeyer was happy with her own level in this year's final. "I played really well this year," said Lutkemeyer, who will begin playing more ITF Junior Circuit events later this year. "I know last year I said I wasn't playing very well, but I think this year I played really good and I'm proud of the way I played. Even though I lost today, I played a good solid match and I'm happy with the way I played throughout the week." Woldeab also couldn't be more pleased with her first Level 1 win. "I'm ecstatic," said Woldeab, who matched her brother's 2017 accomplishment. "I'm really happy. It shows hard work pays off. I've been practicing a lot." Chang saved five break points in his first two service games, then broke at love in the fourth game to take the lead for good. The 15-year-old from Berkeley California then went up 3-0 in the second set, but Cooksey fought back, getting one break back to make it 3-1, and then pulling even at 4 for a second break. "When I got it back to 4-all and I was serving, I had a couple of chances, blew a couple of chances," said Cooksey, a 15-year-old from Grosse Pointe Shores Michigan, who trains with Joe Shaheen at Wimbledon Racquet Club. "I thought that if I got that game, maybe I could take the set and see what would happen, but it didn't turn out that way." Chang was happy to get out of that game and serve out the match. "It feels good," said Chang, who trains at the Berkeley Tennis Club with Morten Christensen and Rafa Cirne Lima. "It's been about a year since I won a title. It's cool; a lot of good players come through here." Cooksey did get his winner's trophy in the doubles final later in the day. He and partner Jeffrey Etterbeek, who were unseeded, defeated No. 4 seeds Lucas Brown and Alexander Karman 6-1, 0-6, 10-7 to take the championship. Cooksey and Etterbeek defeated four seeded teams to take the title. 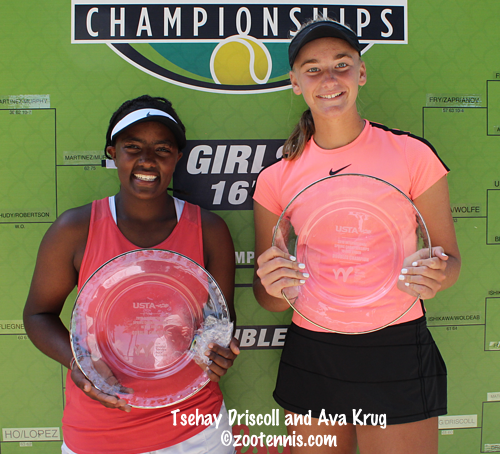 The girls 16s doubles title went to Ava Krug and Tsehay Driscoll, who defeated Makenna Martinez and Maxine Murphy 6-3, 6-2. Although unseeded, Krug and Driscoll did not drop a set in their four victories this week. The 18s doubles champions were decided Saturday afternoon, with unseeded Kacie Harvey and Natasha Subhash taking the girls title, and top seeds Martin Damm and Toby Kodat claiming the boys title. 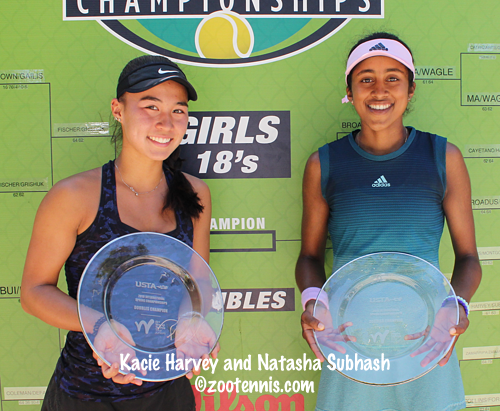 Harvey and Subhash reached the finals at both the Grade 1 Eddie Herr and the Orange Bowl last year, so taking that final step Saturday, with a 6-3, 6-2 win over No. 8 seeds Ellie Coleman and Jenna DeFalco, was especially sweet. "We were really excited that we were able to close it out today," said Harvey. "Third time's a charm," said Subhash, who won the International Spring Championships doubles title last year with Katie Volynets. Harvey and Subhash lost only one set during the week, in their second round 6-1, 6-7(6) 10-7 win over No. 7 seeds Kailey Evans and Robin Montgomery. "We were up and then we became a little bit loose in the second set," said Harvey. "So after that match especially, we need to make sure we keep our foot on the gas, especially in the second sets. Not to let them come back when we win the first set." "We told ourselves we wouldn't do that again," Subhash added. In the final, there was no taking the foot off gas. "I think we kept to our game plan of trying to play aggressive and go for as many volleys as we can," Harvey said. "Both of us feel pretty confident at the net." "We were definitely trying to keep the points short," said Subhash. "We didn't get into too many of the long cross-court rallies, and I think we both served well too. That really helped." Harvey and Subhash aren't sure they will have an opportunity to play together again, with Harvey heading to North Carolina and Subhash to Virginia this fall. "We'll actually be playing against each other because we're in the same conference," Harvey said. "I don't know if we're going to play any more tournaments before we leave, so this might have been the last one," Subhash said. The 16-year-old Kodat and the 15-year-old Damm have many tournaments both ahead and behind them. 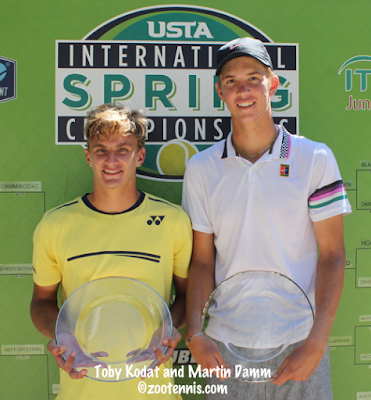 The pair have played together so often that they can't even guess at the number of times, but they showed the value of that familiarity throughout the week and in the final, beating unseeded Braeden Ho and Welsh Hotard 6-3, 6-2. "The friendship helps by a mile," said Damm. Both Kodat and Damm speak Czech, but use it only when necessary, preferring English. "We understand English better," Damm said, "and sometimes we mess it up, especially when it's a tight situation. 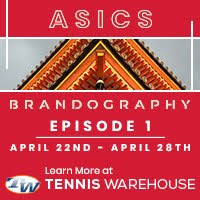 But on changeovers, when the opponents are right next to us, when we're trying to say go line or go cross on the return, for sure we say it in Czech." Both were pleased with their play in the final. "I think we played really well today," said Kodat. "It was a good day for us, we were holding serve well. We didn't give them too many chances. We were very solid today." The match featured only two deciding points, both in the second set, with Damm and Kodat winning both, one on serve, one on return. As for future tournaments, Damm and Kodat are planning to play together often in Europe this spring and summer, when their schedules coincide. For complete results, see the tournament website.